We’re starting to get tomatoes in the farmers markets, but they’re not quite in season, so.. I was fishing through the over-stuffed freezer the other day trying my best to pare down and part with various inedible bricks of this and that, when I stumbled upon a few tubs of frozen Early Girl tomatoes from last fall. Back in August/September, when I had come to the end of my canning tether, I started chopping and freezing the last of the season. The frozen fresh tomatoes were an opportunity to take a stab at a simple and delicious pasta recipe I’d had in Rome in October. 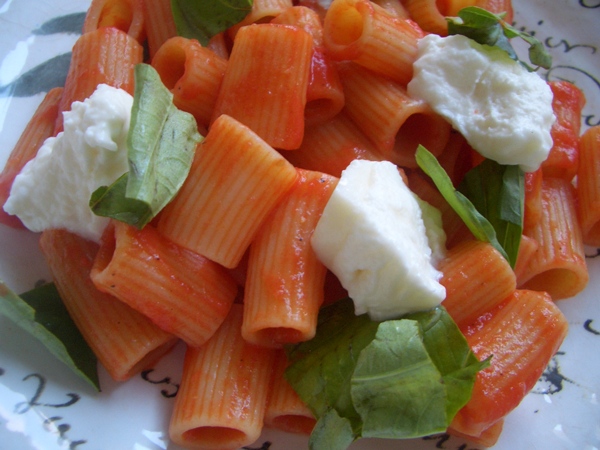 Fresh pasta tubes dressed with the simplest of tomatoes sauces, a little torn fresh basil and chunks of burrata. Burrata is a decadent cheese made with whole milk mozzarella and cream. It’s soft and luxurious and melts right into the warm pasta. If you can’t find it, a good quality whole milk mozzarella will do. The success of this recipe rests on having the best tomatoes. We’re not adding a lot of salt, sugar or herb crutches to get us over the obstacle of tasteless tomatoes. I like Early Girls, but any bright, tangy, sweet tomato will do, and their availability is mere moments away. In a large shallow pan–fry pan, not sauce pan–cook the onion and a pinch of salt over medium heat in about 2 tablespoons (30ml) of olive oil for about 3-5 minutes or until translucent and soft. If using red pepper, add a few pinches and cook for 30 seconds. Add the garlic and cook for about 30 seconds. Add the tomatoes and cook for 15 minutes at a low simmer until the tomatoes have mostly broken down. Let cool. Whiz the sauce in a food processor until smooth. Strain through a fine mesh strainer to remove the skins, seeds and cores. Straining gives the sauce a velvety quality. Set the sauce aside. Cook the pasta in lightly salted water, drain. Add butter if using, and toss to melt. Toss in the sauce. To serve, add the pasta to individual bowls and garnish with torn basil leaves and torn or cut pieces of cheese. If you add the basil and cheese to the whole thing it’s hard to make sure everyone gets an equal amount of the garnishes, and it just looks prettier to do it individually.